The celebration of Columbus Day is not acceptable. The colonization brought with it an immense tragedy that it is necessary to start remembering. Español. Português. October 12th is celebrated in the greater part of the United States as Columbus Day, though not everywhere. California, Oregon, Nevada and Hawaii do not have it as a public holiday, while a number of states have kept the date, but changed the celebration to “Native American’s Day” seemingly unaware of the immense irony of Caucasians celebrating the indigenous inhabitants on that particular day. Rather like the Germans holding an annual celebration to the Beer Hall Putsch on Yom Kippur. That will undoubtedly strike many as a gross exaggeration: Hitler was obviously the epitome of evil, how could anyone not named Genghis or Attila possibly compare to him? Certainly not Chris Columbus, who looks more like somebody’s grandfather than a mass murderer. Yet without throwing anyone into ovens or dosing them with Zyklon-B, Columbus nevertheless bears responsibility for the deaths of anywhere from 15 to 100 million people  and the utter ruination of every civilization from Alaska to Tierra del Fuego. When the Spaniards finally arrived at the Aztec capital, they found in Tenochtitlán an island city of canals to rival Venice, and larger than any European city but Paris and Constantinople. In 1539, Hernando de Soto sought to emulate Cortés’s exploit and conquer his own American empire. 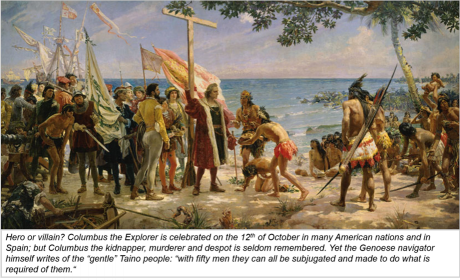 He took 600 conquistadores on a four-year circuit of what would become the US South East from Florida to North Carolina, Tennessee, Arkansas and Texas. He was able to accomplish this amazing feat not because he was a logistical genius, but because the land was “very well peopled with large towns,” which enabled him to steal whatever he needed to feed and shelter his men on their march. Yet there is truth in narrative of a “sparsely settled land” filled with hunter-gatherers when the English arrived, 70 years after de Soto’s expedition. By then, the people had gone. Many had died from European diseases; many more had died from the inevitable famines that resulted as fields went untilled and a complex civilization collapsed. A French expedition up the Mississippi River in 1682 led by the Sieur de la Salle encountered hardly any natives at all in a region that the Spanish had found densely populated. The Coosa, the Caddo, the Cahokian, the Plaquemine: the people, their cities and their monuments were all swept away in a great tide of disease. Such a disaster was not unknown to Europeans; epidemic outbreaks led to the crisis of the 3rd Century in the Roman Empire, to the partial collapse of the Eastern Roman and Sassanid Empires in the 7th Century and to the collapse of the High Medieval civilization in the 13th Century. But European populations were never hit with the array of plagues as deadly and as numerous as those that the Iberian explorers and conquerors took with them to the Americas. Growing up in the 1970’s and ‘80’s, my exposure to early American history was decidedly superficial. The narrative was extraordinarily simple and linear: Columbus discovered America, time passed, and then English colonists began settling the sparsely inhabited coastal regions of Virginia and Massachusetts. The lesson plan on Columbus was little more than repeating that idiotic rhyme: “In fourteen hundred and ninety two, Columbus sailed the ocean blue,” which are the only two line most adult Americans will remember. The rest of our history modules were not much more profound: there were some Indian wars, mostly part of the greater struggle between British America and French Canada, and we mostly won. Fast forward to the American Revolution; beyond which point the history of the Native American becomes less than a footnote. The Trail of Tears was “bad”; the liquidation of the Sioux, the Comanche and Apache nations was also bad, but at least worthy of Hollywood’s attention. I’m not attacking the American educational system; there is no nation that explains to its impressionable youth that their history is based on the liquidation of one race and the enslavement of another. I’m pretty sure the Belgians don’t tell their kids what King Leopold’s representatives did in the Congo, nor do Dutch elementary schools go into too much detail about exactly how the Dutch East Indies were subjugated and ruled. The Germans certainly teach their kids about the Second World War – because they lost and were occupied for 50 years – but the Japanese, who also lost the war, but were occupied for less than 10 years, still deny a great deal of war guilt. I can guarantee that the Spanish don’t teach their kids about their various atrocities, because my kids are going to school there and it is definitely not on the lesson plan. It is entirely understandable that each nation attempt to portray itself in the best light possible, especially to its children. No country that despises itself is going to last very long. Furthermore, the modern nation-state’s founding principle is romantic mythology: “romantic” in the sense of being an epic with clear heroes and villains, while “mythology” in the sense of not being at all accurate as history. Every single modern nation-state has a founding romantic myth: we simply don’t recognize them as such because they are part of our DNA. Think of the British myth of a good King Arthur defending all the peoples of the island of Britain from invading barbarians, or the French with their “Nos ancétres les Galois.” We Americans have our own founding myth of George Washington, the American Cincinnatus, and Thomas Jefferson with his sublime declaration, crafty Benjamin Franklin wooing the French for their support, and the valiant Minute Men coming out in droves to fight for hearth and home. All true, up to a point, but as close to reality as any good Hollywood production. Understandable, but lamentable all the same. There are good reasons why we want to form a patriotic spirit in our children, but there are even better reasons why we want to be honest about our history: mainly to avoid repeating it. No one says that German kids shouldn’t be justifiably proud of their great cultural, scientific and literary achievements; but would anyone in Europe feel comfortable if German schools started glossing over the Third Reich and its crimes? Yet that is precisely what happens in America with the Civil War, and in Europe with its legacy of imperialism. Teaching kids about the horrors of slavery and how it was directly responsible for the bloodiest war in our history does not mean you hate America; and it might make them more understanding of the cultural context that black Americans face every day. Avoidance of that debate only leads to a perpetuation of attitudes of racial and national superiority still all too much in evidence today. This deliberate ignorance continues to plague our societies and creates a real cost for us today. The rich culture of these American civilizations has been lost, in some cases destroyed on purpose, and replaced by a simplified narrative that oscillates between the “noble savage” and the “brutish savage”. Of course they were neither extreme and to characterize them as such is infantile, or used for modern political purposes that have nothing to do with the natives themselves. All too often, these narratives have been used to justify the continued ascendency of an exclusionary political and economic caste composed entirely of the descendants of Europeans. By rewriting history, these elites have successfully prevented any redistribution of power to the descendants of the original inhabitants of the continent. By rewriting history, Europeans have successfully avoided any discussion of reparations for the centuries of pillage by which the wealth of two continents were expropriated to fuel the rise of capitalism and imperialism in the Old World. Columbus’ legacy continues to torment us in other ways. North and South America have, on average, the highest murder rates in the world. It is 2.5 times the global average and more than 5 times the average for Europe. Permissive gun laws are not the explanation either, since many Caribbean islands are still overseas territories of European states and share the exact same gun laws, yet have rates of violence several times higher than the metropolis. The British Virgin Islands, Caymen Islands, Bermuda and Montserrat all are far deadlier than the United Kingdom; just as Martinique, Saint Pierre and French Guiana are all much more violent than France. Just behind the Americas is the other great victim of European colonialism, Africa. 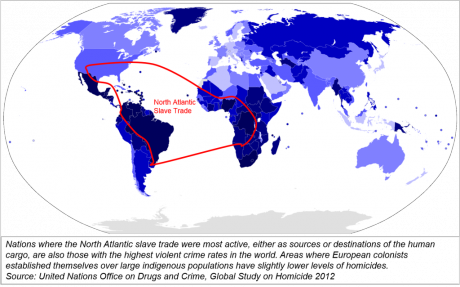 And within Africa, the areas where the Atlantic slave trade was most active are those where violence remains most endemic along with the areas of Southern Africa that Europeans attempted to colonize through the forcible expulsion of the native tribes. The common denominator is slavery. Countries where slavery was prevalent and where slaves made up a significant proportion of the population have significantly higher rates of violence than those where slavery was not significant. And this violence is not evenly distributed: it is disproportionately directed at the descendants of those slaves. In the United States, African Americans are the victims of homicide at a staggering rate of 19.4 per 100,000 of population which is almost 8 times higher than the rate for non-Hispanic whites, whose 2.5 per 100,000 is close to Belgium or Finland. Is it any wonder that gun control is such a partisan issue in the US? White voters have a very different impression of the scale of firearm violence than do black and Hispanic voters. It is almost as if we were discussing three different countries. Brazil is suffering annual civilian fatalities that are on the scale of a small war and it is disproportionately afflicting the poor, black residents of the favelas. 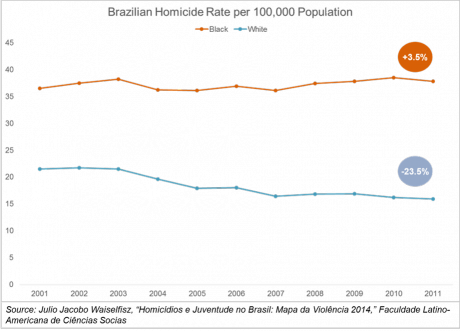 Since 2001, an average of 45,000 Brazilians a year have been the victims of homicide and more than two thirds of them are black. 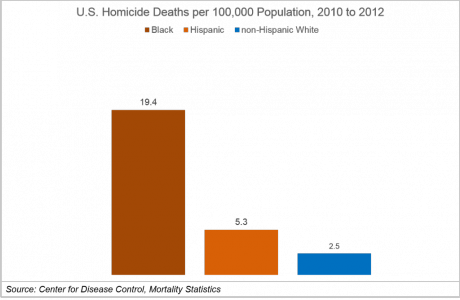 That is not to say that whites are not targeted; but while the rate of homicides among whites has fallen by 23% over 10 years, the black homicide rate has increased by 3.5%. Even more shocking is the fact that anywhere from 15% to 20% of the deaths in the two largest states of Sao Paolo and Rio de Janeiro are caused by the police. That is over 11,200 victims of police killings during the decade between 2002 and 2012, while in 2014 the total increased by 3,000 civilians. The scale of endemic racial violence makes Ferguson look like a tussle at a Rotary Club meeting. Almost every island in the Caribbean – the famed Sugar Isles – have a similar problem with murder. One of the principal exceptions: Haiti, where a slave revolt eliminated the entire European planter aristocracy. It is the poorest nation in the Western Hemisphere due to the deliberate crippling of its economy after the Haitian revolution by Europe and the United States, yet it has half the murder rate of its wealthier neighbor, the Dominican Republic, with whom it shares the island of Hispaniola. A large black population is one key driver, but a large indigenous population is another secondary driver. It should not be a shock that the three Southern Cone nations with the smallest proportion of black and indigenous inhabitants – Argentina, Uruguay and Chile – are also the three Latin American nations with the lowest violent fatality rates. Latin American nations with larger indigenous populations suffer intermediate homicide rates between the more “European-dominant” states and the former slave states. Mexico, the largest Spanish speaking country in the world, historically had almost no African slavery: the indigenous population was large enough that even after the ravages of epidemic diseases, a brutal conquest, and a devastating guerrilla war lasting 40 years, there were still enough natives left to work the silver mines of Zacatecas. 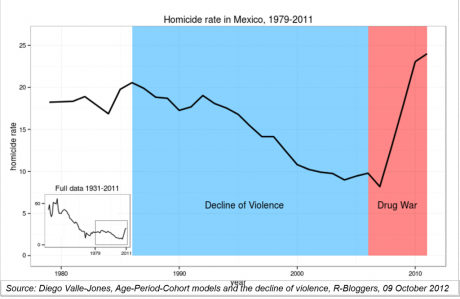 Homicide rates in Mexico were nonetheless high long before competition of rival drug cartels broke out into today’s horrific drug war. Prior to the outbreak of narcotics-related killing, violence was endemic in the states with the highest concentrations of indigenous peoples: Oaxaca, Chiapas, Tabasco, Quintana Roo, Guerrero and Yucatán. It is not surprising. Colonial slavery was only possible through a system of institutional violence and justified by the conviction of racial superiority. The full legal, police and military apparatus of the state was employed to make sure that a small minority of Europeans could dominate and exploit vast numbers of Native Americans and Africans. Violence is inherent and rampant in such a system since only through the continual brutalization of the unfree laborers and the murderous suppression servile insurrection can the system be made to work. Nor does emancipation necessarily change the situation. So long as economic and political power remains concentrated in the hands of an elite ethnic minority, then state violence will be required to maintain that concentration. That is precisely the pattern we observe in these countries. A pattern imposed by the European conquest. I’m not a big fan of reparations, mostly because the bill would be infinitely large. How do you compensate for the destruction of a thousand civilizations? And they are not forthcoming anyway, so better to focus on practical issues. The most urgent issue is to recognize for the reality of history and not sacrifice it on the altar of myth. It is not a question of assigning blame; but there is little hope of changing attitudes and eliminating racism if the bones of the countless dead are quietly interred in unmarked graves. The Jews rightly say of the Shoah, “we must never forget”; but the same is not true of the many genocides perpetrated on the black and brown populations of Africa and the Americas. First we must remember and acknowledge the crimes. And we can stop celebrating Columbus Day under any guise. The total number of aboriginal inhabitants of the Americas in 1491 is the subject of vicious dispute. I have no intention of taking a position on that subject, but I hardly think I need to: the destruction of even the conservative estimate of 15 million human lives is still abominable. There is undoubtedly a basis of fact in the Arthurian legend, but this person was almost certainly not a king and did not unify the British Isles, since most of Wales and Scotland remained independent even in Roman times. The migration of Angles, Saxons, Jutes, Frisii and other Germanic peoples to Britain came not only as invasions, but as a steady stream of settlement over centuries that did not always involve conquest. “Our ancestors the Gauls.” There is undoubtedly Gallic blood in many parts of Europe since this Celtic people were one of the most prolific and widespread in Europe and even Asia Minor, but as a people they were pushed back into the westernmost corners of continent. Modern France is derived from the Franci, a Germanic tribe that conquered most of Northern France during the late fourth and early fifth centuries.